Too Faced's Lash Extension Kit May Have You Rethinking Falsies! I don't mean to brag, but I've never suffered from tragically sparse lashes (okay, except for maybe that terrible time when I sneezed while attempting to operate a lash curler). On their own, I'd say my eyelashes are on the average side in terms of thickness and length, but when it comes to beautifying, my usual rule of thumb regarding lashes is that more is more (within reason, of course). That said, I'm almost always game to test the latest innovation in lengthening mascaras (except for maybe that weird vibrating lash wand that came out a few years back – no thanks! ), and I do have quite the collection of false lashes that I break out for even casual occasions. However, I don't appreciate picking glue out of lashes the morning after, even after a good scrub-down with my favorite makeup remover, so if a product boasts that it can give me falsie-worthy lashes without the stickiness, I'm ready to try it! 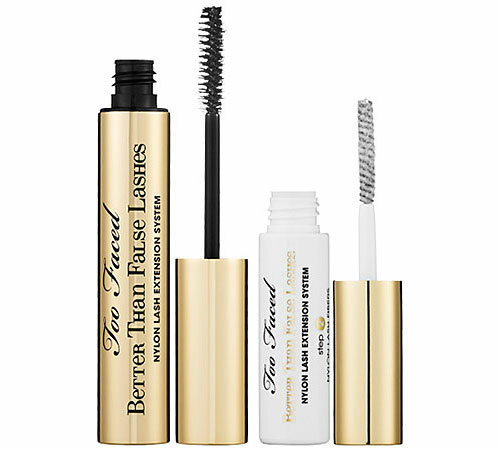 Too Faced's 'Better Than False Lashes' Nylon Lash Extension System is a two-piece, three-step kit that includes using the mascara as an activating base, then applying brush-on nylon fibers that adhere to lashes without the commitment of pro extensions, then sealing the fibers with a final coat of the ultra-black mascara.